So! 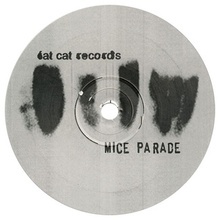 This was one of Mice Parade's earliest releases, the ones till this point being quite limited; this EP, My Funny Friend Scott, is the first listed in Fat Cat's Mice Parade section. This song, quite long by the artist's standards, is nonetheless a good introduction to the style of music Mice Parade represents. As I so often complain, it's difficult to describe, and I resent any categorization of something this diverse. I'd say it's sort of a groove-based instrumental organic electronica, but that's a mouthful in addition to being a completely awful description (sorry). You'll have your own term by the end of the week. The EP included two other songs - the title track and "A Dance By Any Other Name," which for some reason I can't find and subsequently can't describe. Nevertheless, I know this track's the best, because it's great. The loops, the bass, the little whispered noises, the fiddly drone, the multilayered percussion, it's all excellent. It may be a little long, but to me it doesn't feel like it - it's the kind of music that disappears from your attention just enough that you know something good is happening to your ears but not so much that you forget it afterwards. Enjoy! Here's "Organic Reproduction Attempt," by Mice Parade. and I resent any categorization of something this diverse.